Spoiler alert: Moth form was attained. I have to say I am both flattered and abashed that several people have taken the time to ask me what wound up happening with the luna moths I was rearing. I hope I can distract you all from the tardiness of this post with a MASSIVE PHOTO DUMP. Of course, most of these photos were taken with my phone, so, half credit? A luna moth cocoon wrapped in leaves. I left for a weekend research trip and returned to find all but one of my surviving caterpillars had spun themselves up in silken cocoons, also taking advantage of leaves, branches, paper towels, and just generally whatever was available. Most of my cocoons were showed no further signs of life, but two remained rather terrifyingly lively–rattling and shaking around like jumping beans when disturbed. The mystery of the empty cocoon. Taking the advice of experienced luna moth rearer Shawn Hanrahan, I slipped paper clips into the cocoons and hung them all up in my office to await further developments. Possibly, I didn’t think this through very well. A couple of weeks later I tapped one of the active cocoons hello only to discover a hollow shell with no sign of the adult moth. Presumably it was off on an adventure in the lab. Cast off skins inside the empty cocoon. Of course I opened up the cocoon to check out the cast off skins. When a luna caterpillar spins its cocoon it briefly be comes a “prepupa,” shortening and losing the ability to walk. A few days later it sheds its skin (the caterpillar shed at the bottom of the picture) and becomes a pupa. Cast off pupal and larval exoskeletons. The large red-brown pupa looks much like any other lepidopteran pupa. The developing wings and antennae are visible wrapped around the top of the pupa, while a wiggly abdomen is responsible for the movements and rattling of the more active cocoons when disturbed. After about two weeks (unless it is overwintering) the pupa molts again, and cuts its way out of the upper end of the cocoon using serrated spurs near the base of its forewings. Tattered male luna moth recovered after lab adventure. I did eventually recover my wayward vagabond. He turned up a few days later, tattered from his adventure, no longer with the energy to fly. Adult luna moths live only a few days to a week, long enough to mate and reproduce. They survive entirely on energy stored as hungry hungry caterpillars–adult moths don’t even have mouthparts. Row of hanging cocoons, some with exit holes. Having learned my lesson with one adventurer, I moved the other cocoons into a glass terrarium. Above, you can see the cocoons hung up in a row by their paperclips. Several have emergence holes at the top. I didn’t manage to witness any emergences; they take place early in the morning, giving the moth time to pump up its wings before the evening flight period. Luna moth hanging from its cocoon. The moths not only have to get their wings straightened out, they also have to void their liquid meconium–basically all the stored wastes from their transition from caterpillar to butterfly. This staining reddish brown mess is the reason you should never hang your luna moth cocoons over carpets or anything difficult to clean. Luna moth on cocoon with fully inflated wings. My lunas have been emerging one by one every few days over the past couple of weeks. They make for a fun surprise. 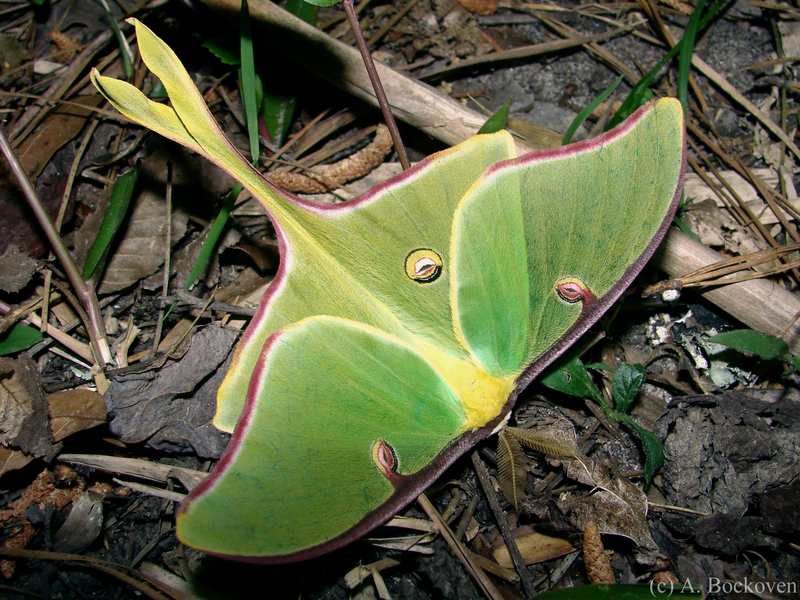 Male luna moths can be distinguished from females by their antennae, which have broader, more plumose fans, in order to help them detect female moths. They also exhibit different behaviors. Female luna moth on wall. Upon emerging and settling in to their new form, female luna moths typically find a perch, and spend evenings emitting a special male-attractant pheromone to help potential mates find them. Males meanwhile, disperse in search of females, whom they can detect across great distances. Underside of a male luna moth. In one impressive experiment, 26% of male Indian luna moths were able to locate caged females when released more than 6.5 miles away. What this translates to in a terrarium is that female moths left overnight will sit and chill, but male luna moths will flap around and tatter their wings to pieces….Not that I’m speaking from experience or anything. Startling conclusion: I sucessfully reared moths to adulthood! Many of them with out significant trauma! I declare the luna moth saga a success…and move gratefully on to less time-consuming insects to rear and observe. A luna moth caterpillar with an Argentinean peso for scale. For some reason this was the only coin I could find. I wasn’t going to do another caterpillar post but I haven’t had a chance to key out the springtails for the other post I’m working on, so here you go. As you can see, they’re still growing like fiends. Also, I haven’t been to Argentina in two years; how is that peso still in my wallet? Overnight all my caterpillars turned into evil masterminds. Or so it would appear. Just days before they all appeared to be perfectly innocuous little caterpillars who sometimes tried to chew off their siblings’ faces. But now just look at that caterpillar! He’s clearly up to something. Someday soon I will be a beautiful butterfly. I can’t find much in the literature on this reared-head posture–which appears to be pretty common in this family of caterpillars–but popular opinion around the internet seems to be that this is a defensive/camouflage posture to make the caterpillars look less like food to hungry predators. They do resemble little green twigs, although it’s kind of creepy when they’re all lined up in a row staring at you. It also puts them in a good position to employ another defensive response: clicking and puking! A luna moth caterpillar in feeding posture on a partially eaten leaf. When disturbed, late instar luna caterpillars and many other bombycoids (silk moths, hawk moths, emperor moths, etc.) make an audible “clicking”, “squeaking” or “crackling” noise with their mandibles and then regurgitate noxious chemicals. The regurgitant is apparently broadly deterrent to both vertebrate and invertebrate predators: in the kind of science experiment I love, Brown et. al (2007) demonstrated that both ants and mice reject food treated with caterpillar puke. I haven’t heard mine click, but they have spewed brown goop all over when I change their leaves. I chose not to eat them, so it was apparently an effective deterrent for human predators as well. The luna caterpillars are still rocking along so far. They eat like hungry hungry hippos so it’s a race to keep them well-foliated. I’ve been making lots of trips down the street for more walnut leaves. But how can you not love these sweet little faces? Fun story: Today when I was snipping of bits of leaves to move the caterpillars to fresh foliage I accidentally snipped one caterpillar in half. (I did mention I’m terrible at caterpillars.) Anyway, the two nearest caterpillars immediately started chowing down on their dearly departed sibling like it was the best thing since bacon ice cream. Then, apparently, they got so carried away they started trying to eat each other, and for the first time in my life I got to break up a caterpillar fight. I’m fuzzy like a teddy bear! And may also try to eat your face! My caterpillars are a bit overcrowded at the moment, so I’m planning to spread them out across a few more containers. On the other hand, I suspect if I don’t they’ll take care of the issue for me. First this quarter, next the WORLD. Luna moth eggs at 80x magnification. My friend Shawn Hanrahan collected some luna moths last Wednesday, and since they dropped hundreds of eggs he offered batches to anyone interested in rearing some lunas. I am terrible with caterpillars (-no, really. The only lep I have successfully reared to adulthood was a pierid that fell to the floor of the container and wound up with useless crumpled wings-) but I decided to give it a go. So with advice from Shawn (check out his extensive body of pictures and pages on Wikipedia) I have set out on the adventure. If you don’t hear further you can assumed I failed miserably and am sunk in depression. On the upside, you can see I am still having tons of fun with the iPhone-dissecting scope photography. The grisly relic started wriggling around. I had actually managed to catch a late-emerging caterpillar in the few minutes of it’s emergence while under a scope with camera iPhone at the ready. Hatching luna moth with eggs. Obviously I took lots of pictures, and even managed to snag a bit of video. Moving target don’t make great subjects for scope photography (especially with an iPhone that has to be held at *just* the right distance and angle to pick up the image through the scope) but I got a number I quite like. Hatchling luna moth emerging from egg. The spiky little caterpillar wriggle and flopped pretty energetically, apparently attempting to drag itself free of the shell, and it was only a matter of minutes before it finished the process and begin busily creeping around the dish. After a short period of observation I transferred it back to the container to enjoy a leafy banquet with its siblings. Newly hatched luna moth and egg shell. I realize at this point I failed to provide any kind of reference for how exceedlingly tiny these little guys are*, so next is a photo with an insect pin for size reference. As an aside, I had no idea my insect pins were so glitzy. Newly hatched luna moth caterpillar with pin head for scale. How many luna moths can dance on the head of a pin? Next week: baby pictures! Or something. 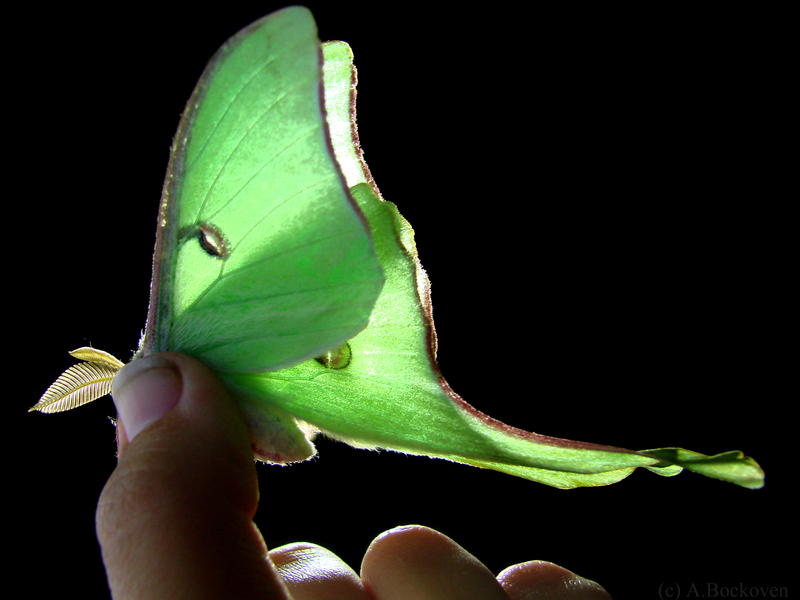 A luna moth (Actias luna) with wings lit from behind. We set up a light sheet in Sam Houston Park early this spring, and were positively swarmed with dozens and dozens of luna moths. In person, I found these moths to be somewhat less graceful than certain sleep aid commercials have led me to believe. They arrived in the area of the light sheet in a commotion of wings, and fluttered around bouncing noisily off everything in the vicinity before dropping to the ground. Occasionally, they managed to cling to someone’s hair or shirt like a colorful decoration. However, whatever they lack in grace (at least around lighted obstacles) they make up for in impressive size and striking coloration. These large, charismatic moths are well known but rarely seen, as populations reach adulthood and mate only once or twice a year, and the moths hide away during the day. Luna moths live only a brief time in their adult form, about a week, and their delicate wings quickly become tattered. Like other saturniid moths, they don’t feed as adults, and lack the coiled tube mouthparts of other butterflies and moths. Moths in the family Saturniidae are easily recognized by their large size; stout, fuzzy bodies; absent mouth parts; and broad wings. They also generally have large feathery (plumose) antennae, which assist them in tracking down mates. A luna moth (Actias luna) on the leaf litter.